It's easy to teach your baby, toddler or preschooler to read. When my first daughter was born, I heard about baby reading. I was definitely a skeptic at first. But I thought what if it could actually work. The potential benefits to my child could be huge. So, I gave it a try. I bought a DVD series called Your Baby Can Read (YBCR) and found a website called starfall.com. Everyday, starting at 9 months, she watched a YBCR DVD while I fed her lunch. And we went through the ABC portion of starfall.com. When she was 21 months, I realised that she could sound out simple words she hadn't seen before. Right after she turned two, I picked up a board book at the library, to see if she could read it to me. She was able to read the whole thing. Her reading was tested in kindergarten and she had 5th grade reading skills. She is 7 now in 2nd grade. She usually spends two to three hours a day reading books aimed at the 4th to 5th grade age group. Are there long term benefits to learning to read so early? We don't know because no studies have ever been done on baby readers. There are a few studies that looked at preschool readers. Those studies have found that early readers have more advanced reading skills than children who learn to read at 5 or 6. If you would like to teach your baby, toddler or preschooler to read, this is a list of some great free and paid resources. Your Baby Can Read - these DVDs are now available for free on Youtube. Start with the starter video and then move onto videos 1, 2 and 3 and finally the Review video. You show the starter video for one month. Then show the rest for two months each. You should show previous videos regularly for review purposes. Brillkids Little Reader - I used this with my 2nd child and it's an excellent product. It will cost a couple of hundred dollars to buy but I found it to be very effective and easy to use. Little Reader is a downloadable software product. It requires only minutes a day versus 30 to 40 minutes for Your Baby Can Read. Visit brillkids.com for more information and an excellent baby reading forum. Starfall.com - this is free. Use the ABC section to begin with. Readingbear.org - this is another great free website. It's designed for preschoolers but can easily be used with babies and toddlers. Essay on Baby Reading - this is a free downloadable essay by Larry Sanger who is one of Reading Bear's creators. The essay provides lots of helpful information and tips. You will also find a link to free printable flashcards. 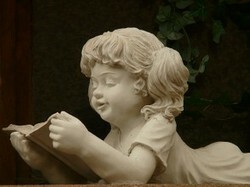 See http://larrysanger.org/2010/12/baby-reading. Teach Your Child to Read in Just Ten Minutes a Day by Sidney Ledson - this book can be used with toddlers and preschoolers. I agree. I read a lot to my kids as well. My older child spends most of her time reading now. When children start life with two languages, they have an advantage right from the start.